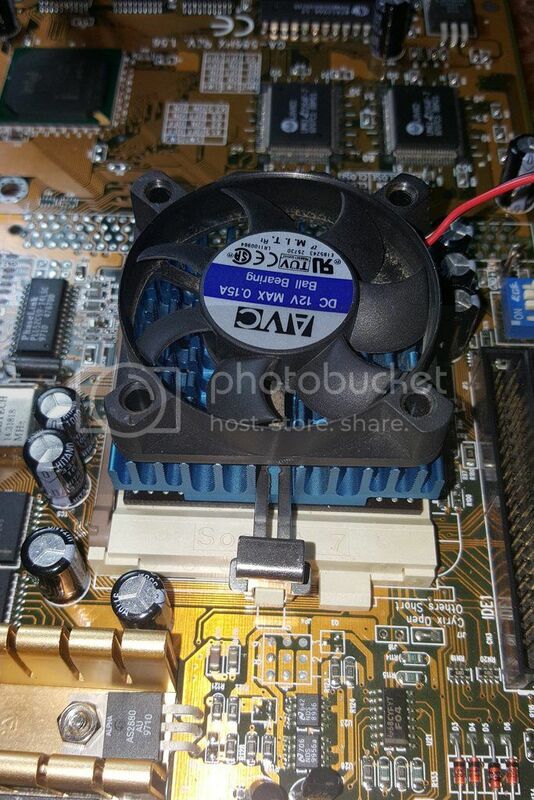 I have a Pentium 200MHz with MMX for a socket 7 motherboard and the original fan is 50mm but I cant find any Noctua or similar in the 50mm range so I have a 40mm Noctua NF-A4x10 FLX fan that I am not using the yellow wire so its running at 12 volt all the time but the 40mm fan doesn't quite fill the heat sink all the way would this fan be good enough? 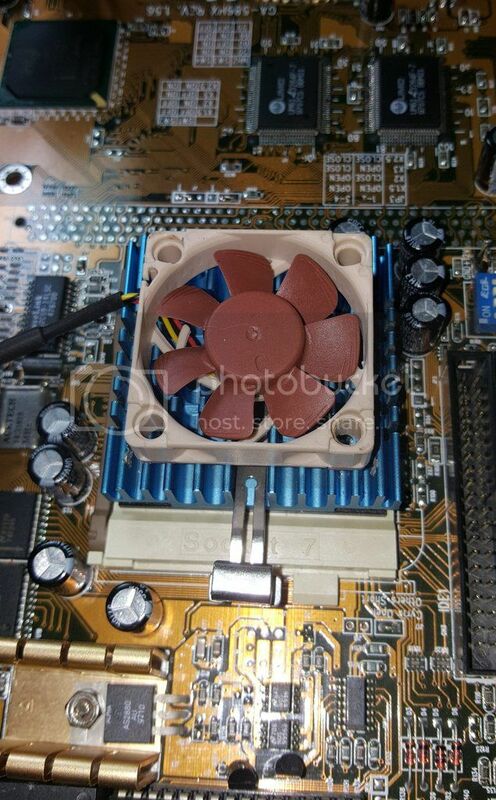 For a Pentium MMX, it will be just ok I believe, we were using tiny teeny little fans back in the days anyways. If you are not happy with any reason, please note that you can use socket 370 fans also for socket 7, they are phsically compatible. I guess it should be fine but I would try to get a proper sized fan. Unfortunately 50mm fans are not that common anymore and most are too loud for my taste. Here are 2 50mm fans that are reasonably quiet. It might be me but thats a double negative im not sure when you were saying something is right, but is a 40mm noctua good to you? A P200MMX has a TDP of around 14W. This is really not a lot. If the ventilation in the case is good it could also work without any fan. I would be more worried that this little fan would be quite noisy. GabrielKnight123 wrote: It might be me but thats a double negative im not sure when you were saying something is right, but is a 40mm noctua good to you? If you're referring to my post then most probably it's me since I'm not a native speaker. Using different words: I'm sure a modern noctua 4cm fan is better than a 90s 5cm one. btw and again, if you were referring to my post, where's the double negation? Honest question, eager to improve my English. realoldguy23 wrote: I would be more worried that this little fan would be quite noisy. I also got one of those 40mm noctuas in my 486 @ 12 Volt and they are audible, but nothing you could call loud. Hi Konc when you said "yeah come on, I would replace any 90s 5cm fan with a 4cm noctua anytime" it to me was like saying - "yeah right, I would anytime", when someone says yeah right thats saying "I disbelieve that fact" with a hint of sarcasm and the "I would.....anytime" was not clear enough to know if that statement was a part of the first statement. But also your statement is clear and in full taken as true I guess it can be taken both ways it depends on the person reading it. English has some confusing grammar at times. @OP: That fan should work just fine, even if it may look awkward. konc wrote: ... Honest question, eager to improve my English. Your original post reads like something a teenager might write on Twitter. Aside from the fact that you've confused the OP, emulating social media-speak or SMS-speak is hardly the best way to improve your English; actually spending some time to write clearly-worded posts (which you are capable of doing, given the content of your second post) is better. Doesn't the 60mm noctua fit on a 50mm HS ? I think it has 50mm space between screws. Nidec, Sanyo/San ace, Delta, NMB, YS Tech are all quality fans and many are ball bearing fans and can be had from ebay rather easily and can be 10 each and long wait. 40mm and 50mm do exist there. These fans have a dead spot under the hub anyway. I wouldn't sweat it. My daily runner for several years was a fanless 233mmx. The Packard Bell case was fanless too, other than the one in the psu.